Frugal & Fabulous: Review: Multigrain Cheerios Dark Chocolate Crunch! 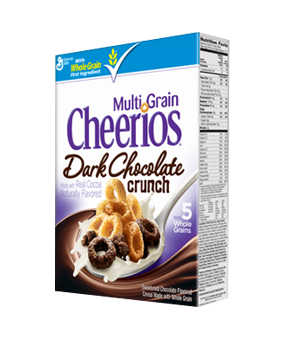 Review: Multigrain Cheerios Dark Chocolate Crunch! I love Cheerios, so when my friends at Plateful gave me the opportunity to try their new Dark Chocolate Crunch Multigrain Cheerios - I was psyched! These Cheerios combine the great taste of Cheerios Multigrain with the sweetness of chocolate. I like that it's a good-for-you cereal but with a little sweetness added in. I can't get into cereals that are just chock full of sugar - so this cereal is a great happy medium between the two. And at just 110 calories and 15g of sugar, this cereal is a smart and delicious snack! My husband and I liked this cereal so much that after I got this box, I pulled some coupons for a Cheerios deal and I actually bought three more boxes of this same exact cereal! It's one of our new favorites for sure! Usually cereal kind of takes a little while to get eaten in my house. We just don't always eat it everyday so a box might last a week or two. Well let's just say this whole box was gone within a matter of days! Are you a Cheerios fan? Have you tried Multigrain Cheerios Dark Chocolate Crunch? What did you think? Read more about Cheerios and all of their different varieties on Cheerios.com!